Hi I'm back - I've had quite a busy few days. My massage last week was absolutely wonderful. I felt so totally relaxed at the end of my indulgence. Thanks everyone for sharing your idea of your ideal self indulgence. I have had a couple of days creating some jewellery and organising some dates that I can get involved in a couple of markets. I am now going to work on uploading some photos onto my DavineRaeDesign website. Maybe I will even get my ArtFire website up and running. The time has come for me to move forward. This is BEAUTIFUL Davine! I'm wowed! Awesome to hear that you enjoyed your special day, and all the best on marketing your jewelery, you do such a wonderful job on each piece! I love that necklace!! Beautiful!! What is it made out of? 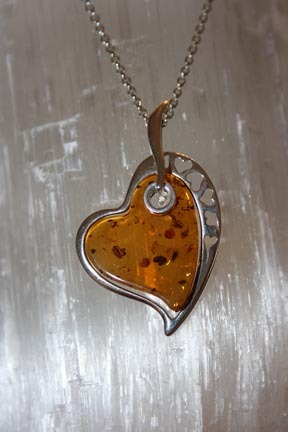 Thanks Ladies - Gayle this pendant is Baltic Amber and Sterling Silver. WoW, that is a gorgeous heart!!! Well done.